For Michael Franti every Friday is Franti Friday. On that day he uploads a self-made video to his YouTube page as a way of connecting with his fans on a more personal level. Sometimes Franti takes fans on the road with him or brings them into his kitchen to teach them how to make rice and beans. Other times, he focuses on one of his choice charitable causes like the Ubuntu Education Fund, which helps raise money for underprivileged kids in Africa. It’s these particular videos, the ones that stay true to his activist roots, that Franti’s most happy to share. When Franti first started making music 27 years ago with his punk band, The Beatnigs. He wanted to be the guy holding the megaphone, calling other charitably minded humans to battle. As he’s gotten older, his priorities have changed. Now he’d rather be the guy who when the world ends is with his family rather than leading the rebellion. Franti’s musical style has changed since his early days. No longer is he the spoken word troubadour with a guitar slung on his back. His latest album, All People, with his band Spearhead, continues in the same pop vein of his previous two releases, specifically 2009’s All Rebel Rockers, which garnered him his first mainstream hit with “Say Hey (I Love You).” But even though Franti’s gone pop he’s still able to send a clear message. This time around he’s just combined it with an EDM-style beat. On the verses he talks about a lot of political things that are happening, everything from the Occupy movement to the LGBT community’s struggle for equality, but on the chorus he makes it clear that before the clock strikes twelve, he’d like to be with the ones he loves. 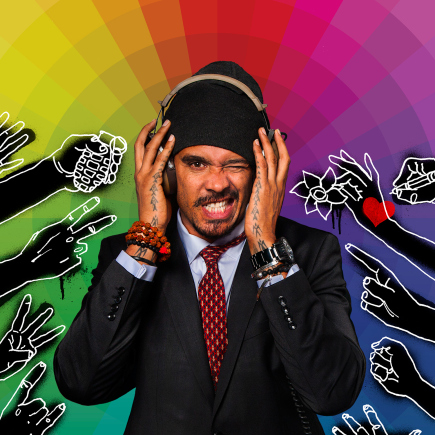 On the album’s lead single, “I’m Alive (Life Sounds Like)” Franti whistles and bops around as he talks about finding the one person in the world who just gets him. He says the love song, like the rest of the record, is a metaphor for the bigger issues that are going on in the world today. But whether it’s a dance song or something a bit more stripped down, Franti says every song on All People focuses on what’s happening in the world today from larger issues to the smaller issues that any person in the world could relate to. Compassion being the biggest theme. Franti wants to inspire people to get up and change the world, but he understands that sometimes you need to start small to make a larger change.